Hosting Thanksgiving can feel like a daunting task, whether it’s your first time or your tenth. After all, it’s one of the most food centric holidays of the year. Luckily for you though, we’re kind of experts in the kitchen. We’ve got plenty of tips in store to help make your holiday smooth sailing from here on out, so that you can spend more time enjoying the company of your family and friends and less time stressing out about the meal. This may sound like a no-brainer, but you’ll want to do a one over of your entire kitchen before guests arrive. Make sure you have all the necessary equipment you’ll need, like plenty of cutting boards, a roasting pan, pie dishes, a meat thermometer, aluminum foil, etc. Think about all the dishes you’ll be preparing and the tools that are essential to your success. You can easily eliminate much of your stress simply by ensuring you’re prepared for the holiday ahead of time. If you’re hosting Thanksgiving for the first time, it may very well be the first time you’re cooking a full turkey as well. Make sure to do your research, as some elements to cooking the perfect bird may not be as intuitive as one would think. For example, when preparing a fully frozen turkey, you need to be prepared to thaw it for several days. In fact, it’s said that it takes a fully frozen turkey one day to thaw for every four pounds in weight. Who would’ve thought? Do your research ahead of time and develop a game plan for how you’re going to cook a great turkey, and you’ll rest easy knowing you’re going to knock one of the most important elements of Thanksgiving Dinner out of the park with ease. Don’t get caught up dicing vegetables on the big day. Go easy on yourself and do as much of the preparatory work ahead of time as you can. There’s no sense in spending more time in the kitchen than you have to on Thanksgiving Day, when you can spend it mingling with family and friends instead. Worried about the outcome of a certain tricky dish or new recipe? Don’t be afraid to do a practice run in advance of the holiday. Nail down the recipe and feel confident in your skills, and you’ll eliminate much of the stress of hosting Thanksgiving with very little effort on your part. Last but not least, never underestimate the power of a little meal prep. There’s plenty of Thanksgiving dishes that can be made the day before and taste equally delicious. Cook up what you can in advance, so that you have more time to focus on the trickier dishes on Thanksgiving Day and less of need to stress. Not to mention, any leftover time can be spent enjoying the holiday with the people who matter most. 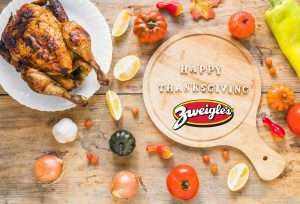 Have you ever thought about hosting Thanksgiving? What are your tips?